Note: My apologies for this unfortunately long post. I’ve attempted to align smaller versions of the pictures side by side but have failed miserably and feel it’s best not to teach my daughters any more bad words than they’ve already learned up to this point. Also, please forgive the few misspellings and the constant bad handwriting. Note Too: The photos appear as close to the physical swatches as I can get them on my home monitor. Your version of the pictures may vary substantially from the way I see them. 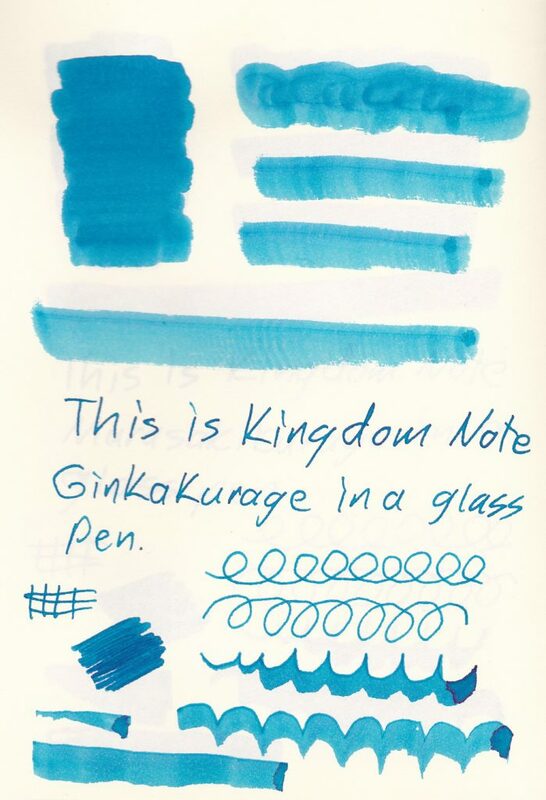 For reasons I’ve mentioned before I consider myself the official international distributor of Kingdom Note‘s Japanese “Biological” series of inks. They feature colors taken from flora and fauna that live in and near Japan. Although I don’t own all the inks, I did take samples as they passed through the variety room and, based on those, bought several for myself. 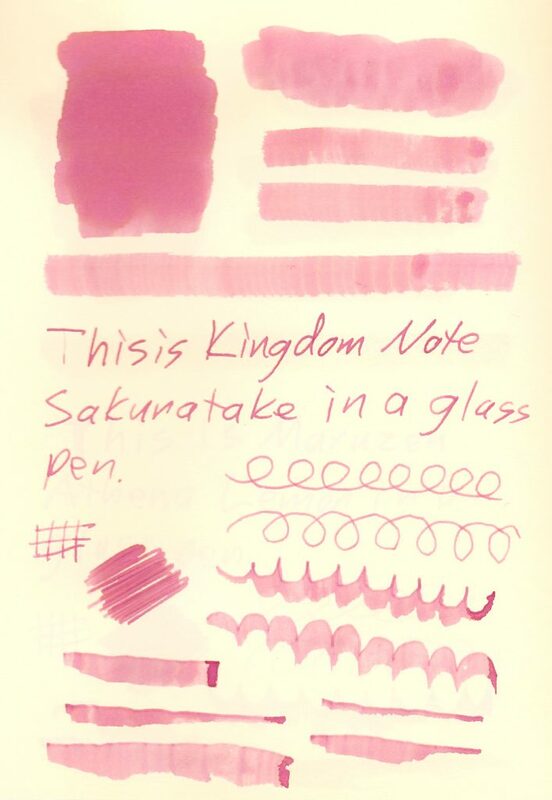 In general, I find the KN inks to be less saturated than many other specialty Sailor inks, Bungubox for example, but they are gentle on your pens. 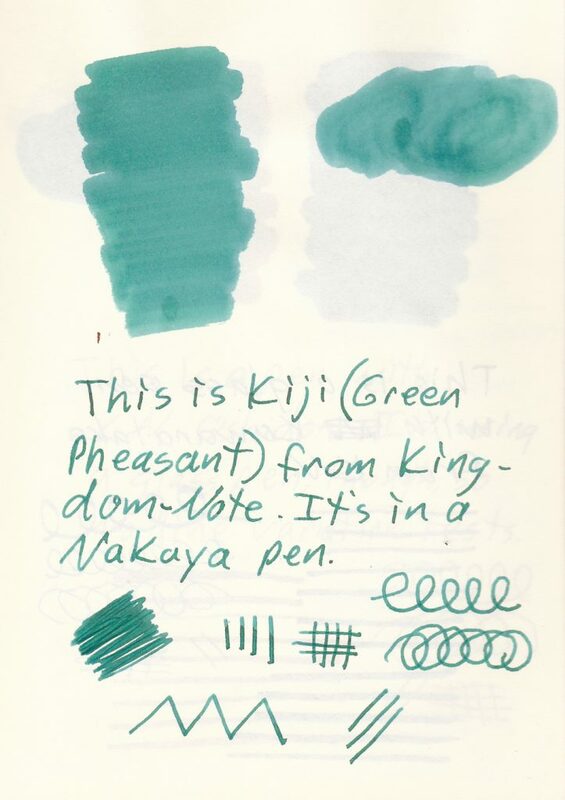 In this series my favorite is Kiji (Green Pheasant). 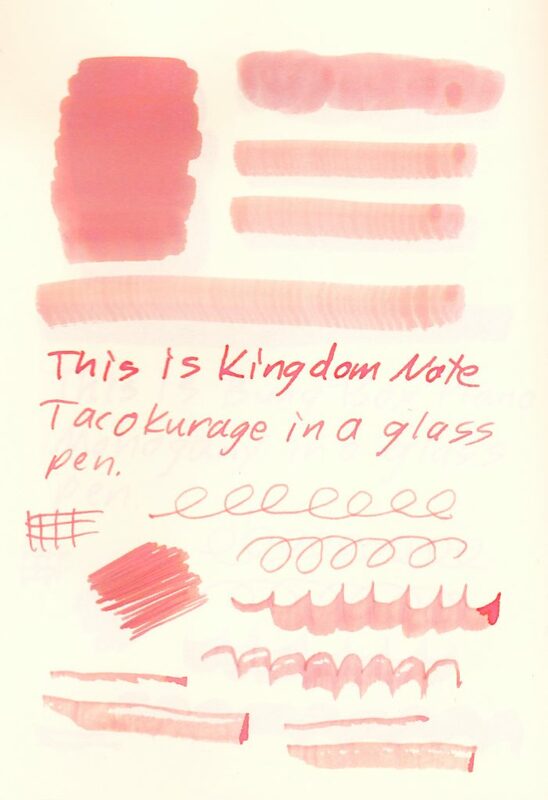 It has more shade and sheen than seen in the photo below. It also tends to go down dark but dry with a paler look. Oshidori (Mandarin Duck) has a nice terracotta look and is almost always in one of my pens. 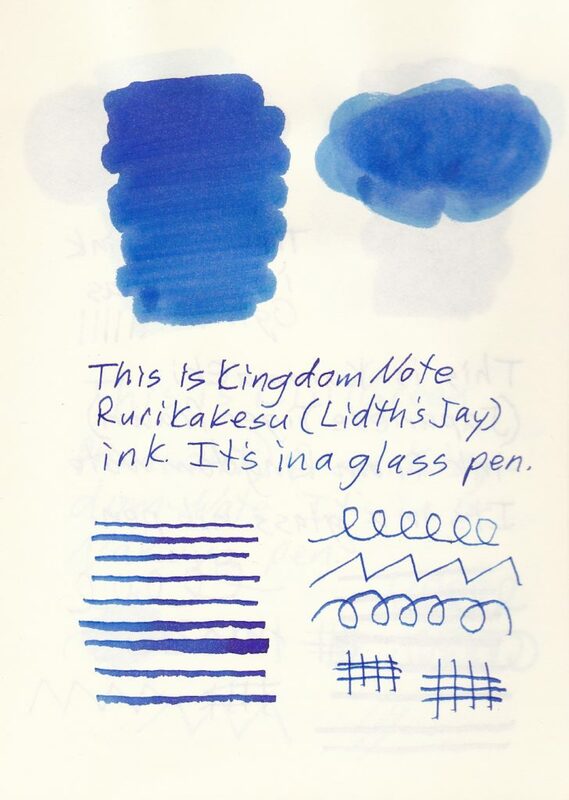 I also like Rurikakeshi (Lidth’s Jay) but there are other blues I like better. Lidth’s Jay is a bit more pale than as shown in the photo. 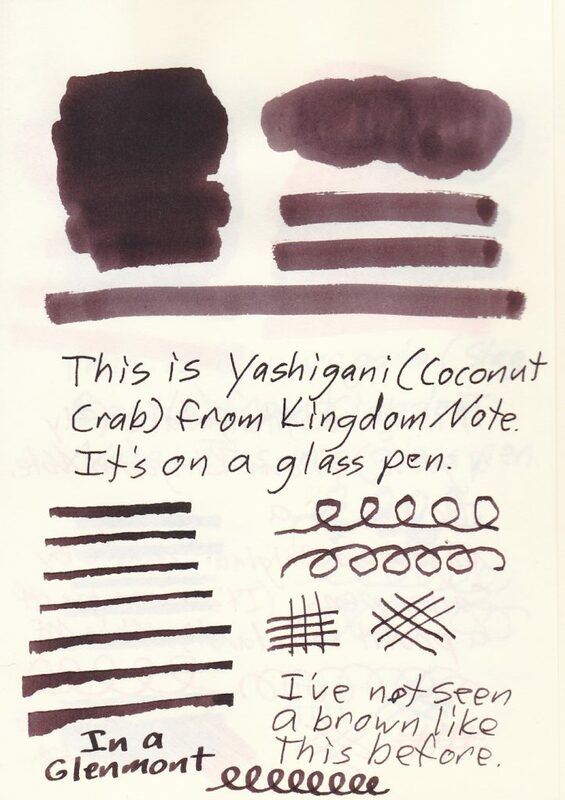 In this series I’m particularly fond of Yashigani (Coconut Crab). 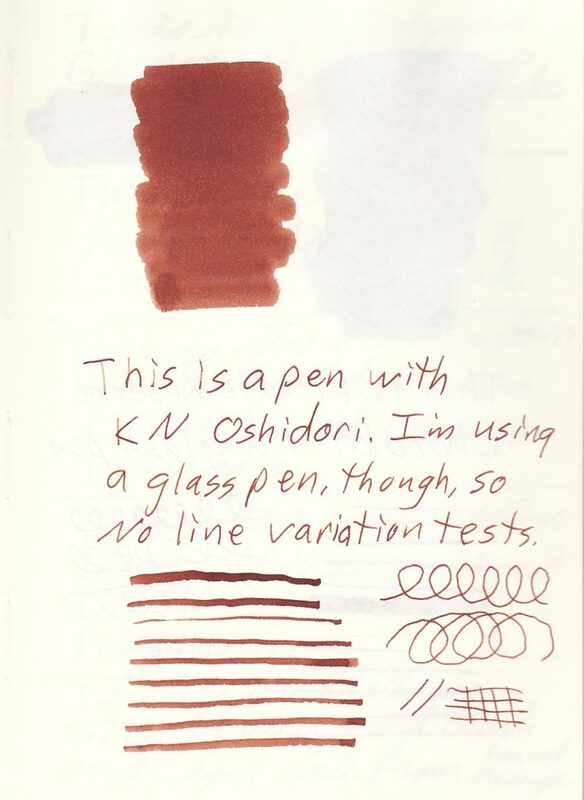 I like the mahogany/chocolate look and like that it works in different nib sizes. 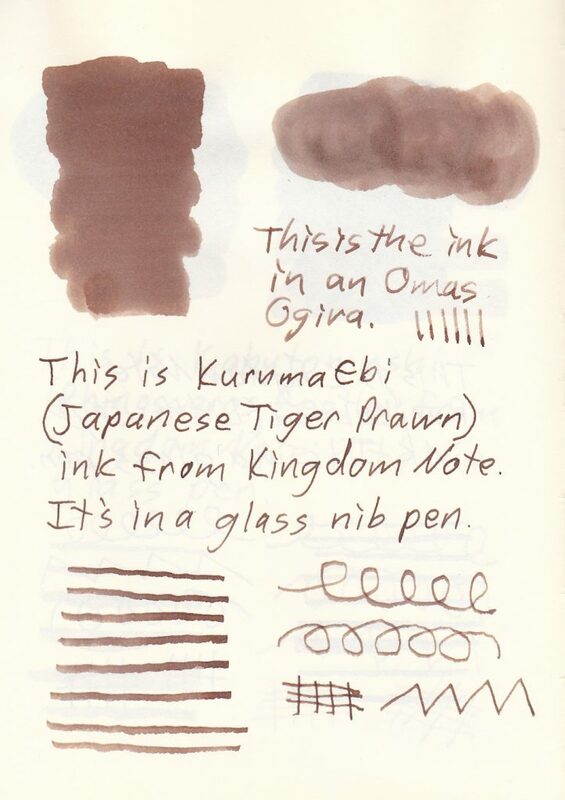 I also like Kurumaebi, but mostly in medium and broad nibs. 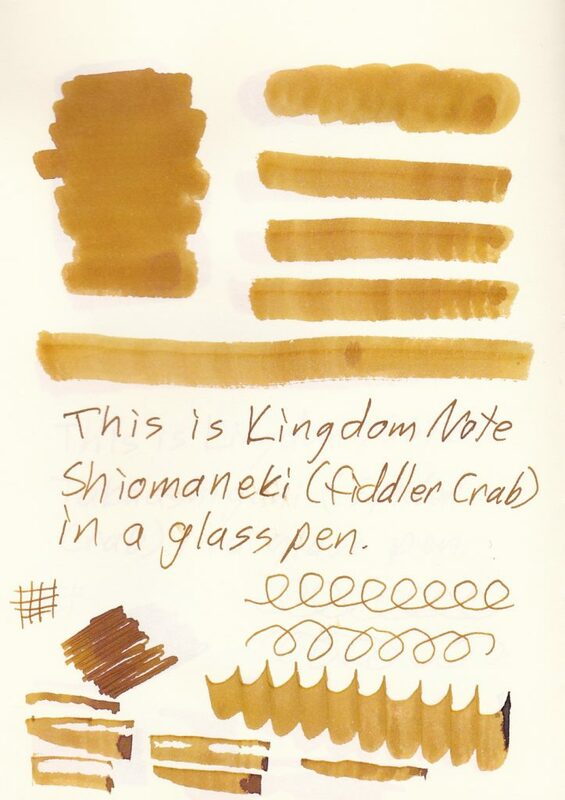 Shiomaneki (Fiddler Crab) is another favorite, although I understand why people don’t like it. I think it works best in wet medium and broad nibs. 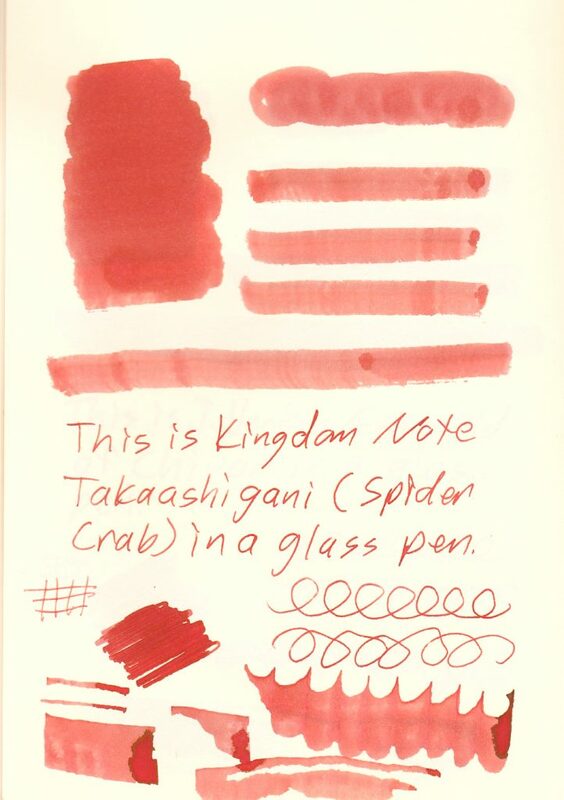 I like Takaashigani (Spider Crab) but only in certain pens. I’m not as fond of this series as the others. 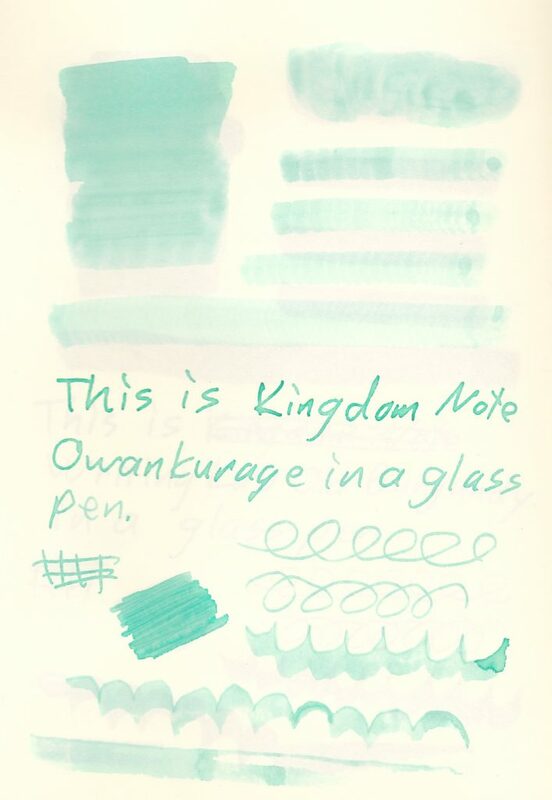 In fact, the only one I own is Kawaratake (aka Blue Fungus). 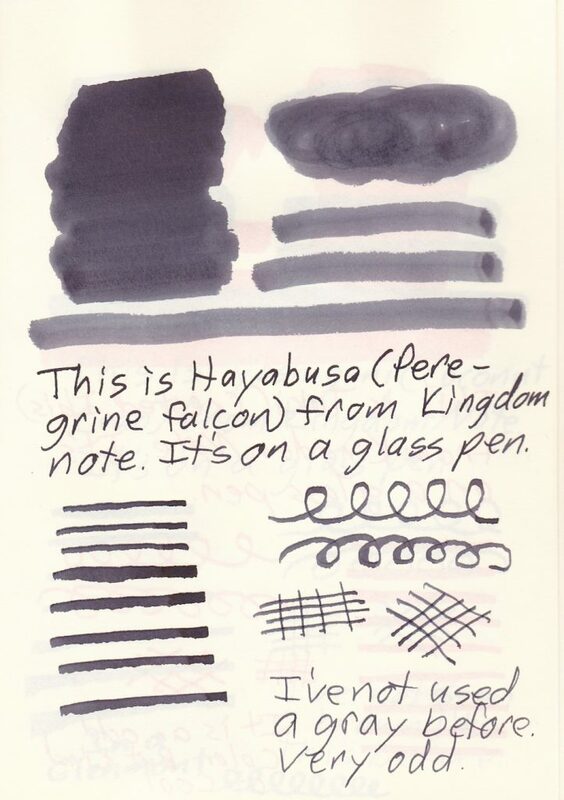 It is one of my favorite blue inks (I can’t decide if it counts as a blue-black or not). 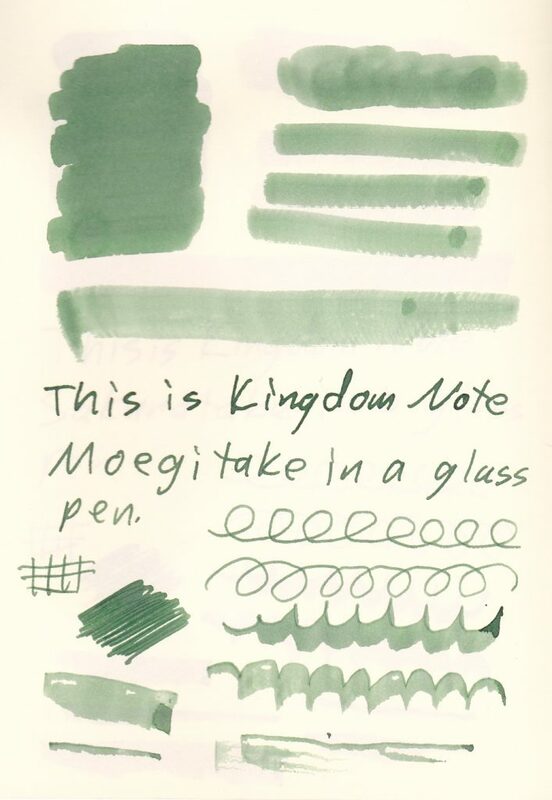 I also like the look of Moegitake (aka Green Mushroom) but haven’t used it. 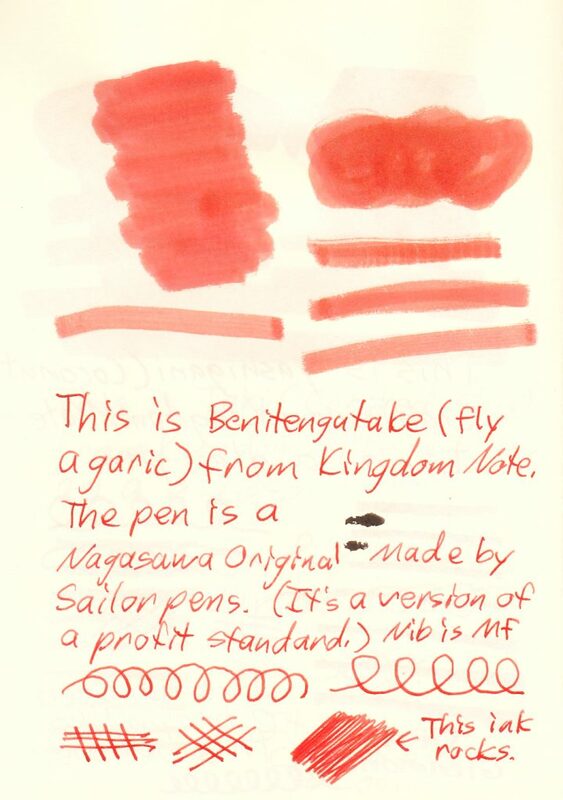 Benitengutake (Fly Agaric) reminds me of Pilot Iroshizuku Fuyu-Gaki. I don’t currently own a bottle, but it’s on the well, yeah, maybe some day list. My mother always says the only good bug is a dead bug, which means she would probably smash these bottles once she saw the pictures of bugs on them, but this is probably my favorite series. 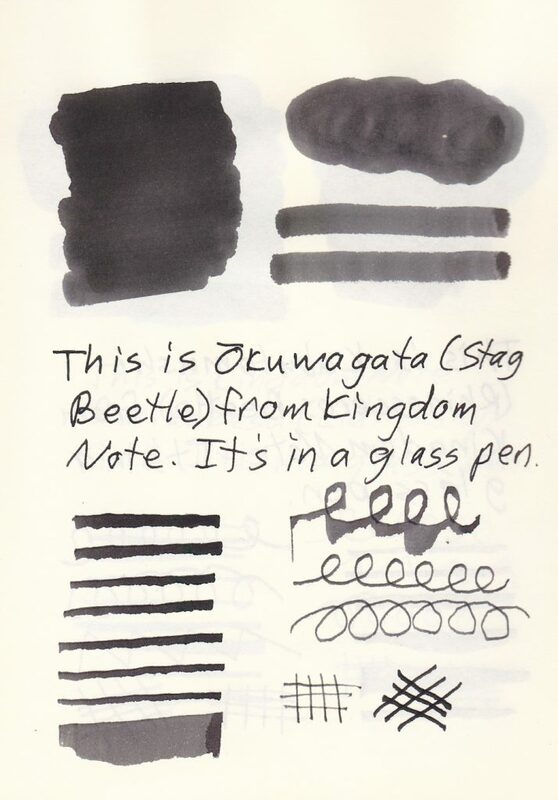 The only one I don’t own is Okuwagata (Stag Beetle). 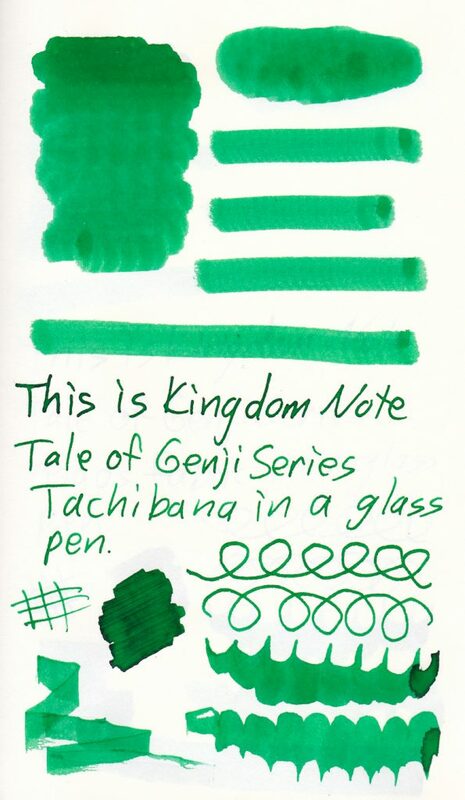 It has a nice green sheen to it, but there are other black inks I like better. 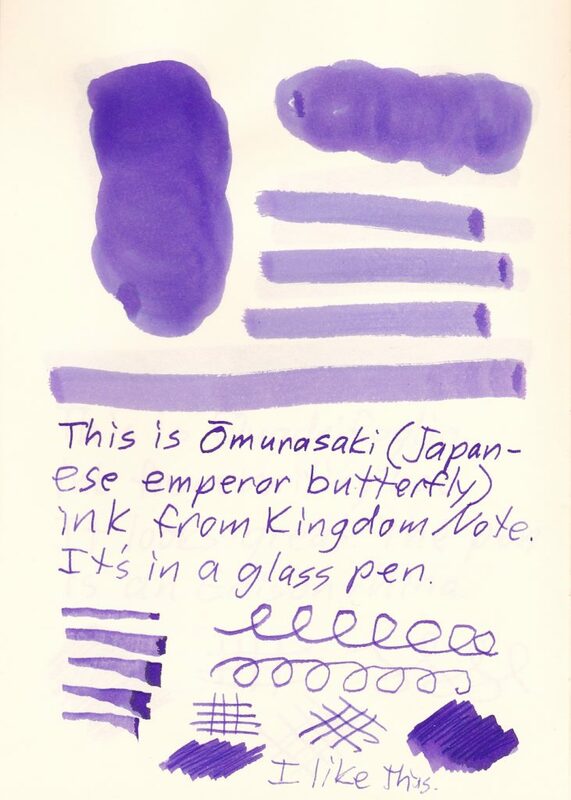 Omurasaki (Japanese Emperor Butterfly) is usually in at least one of my pens. Note that it may be slightly more lavender than the picture below but I got is as close as possible. 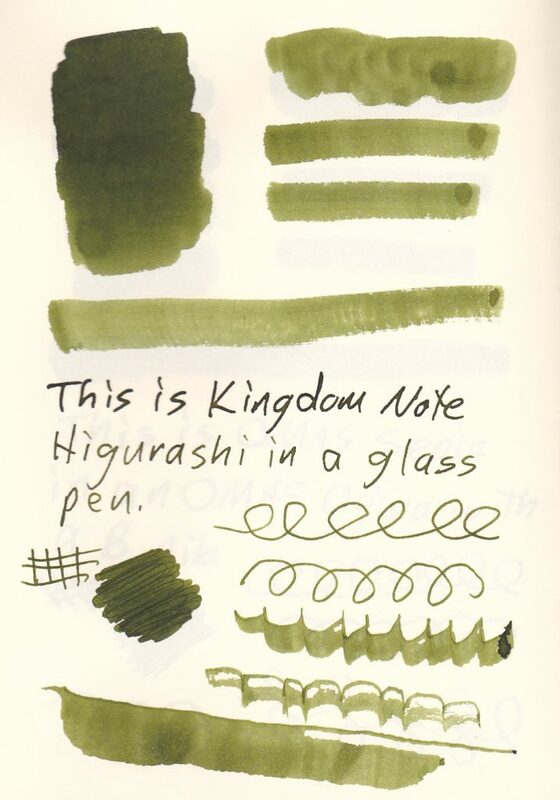 Higurashi (Green Cicada) is a new favorite. 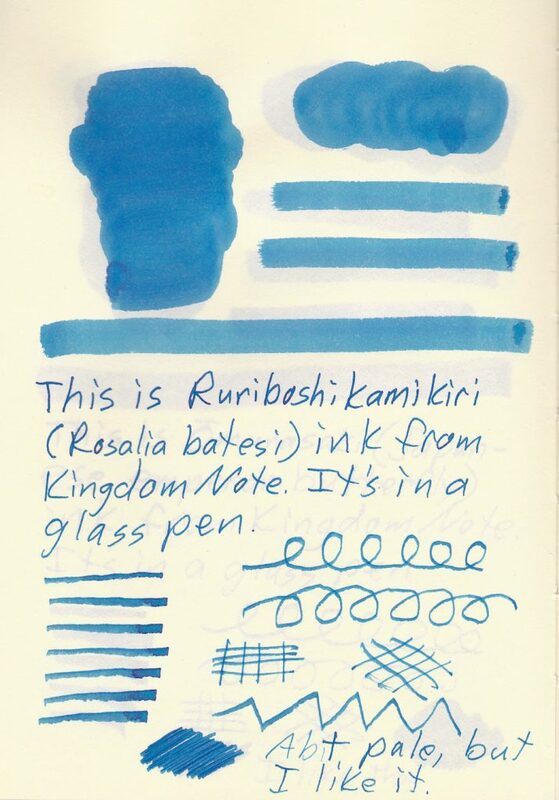 Ruriboshikamikiri (Blue Beetle) is a nice blue. 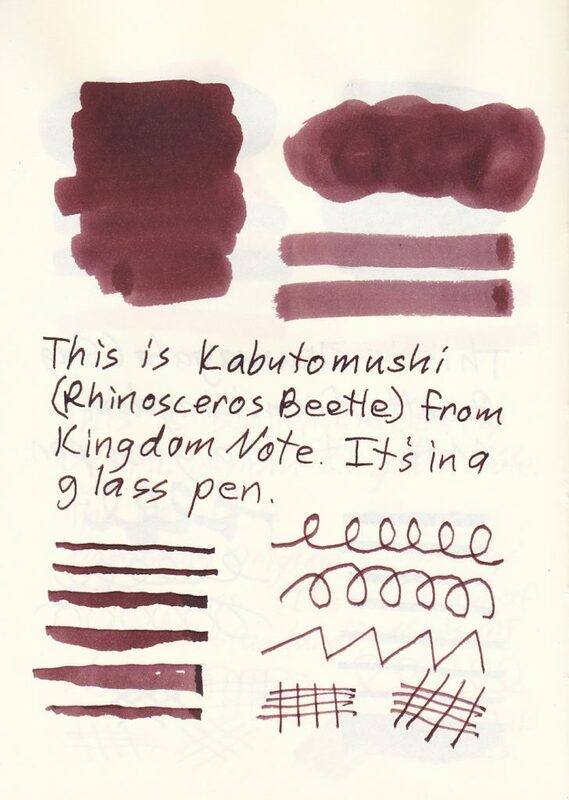 My favorite, though, is Kabutomushi (Rhinoceros beetle) Yes, I know it’s misspelled on the swatch. 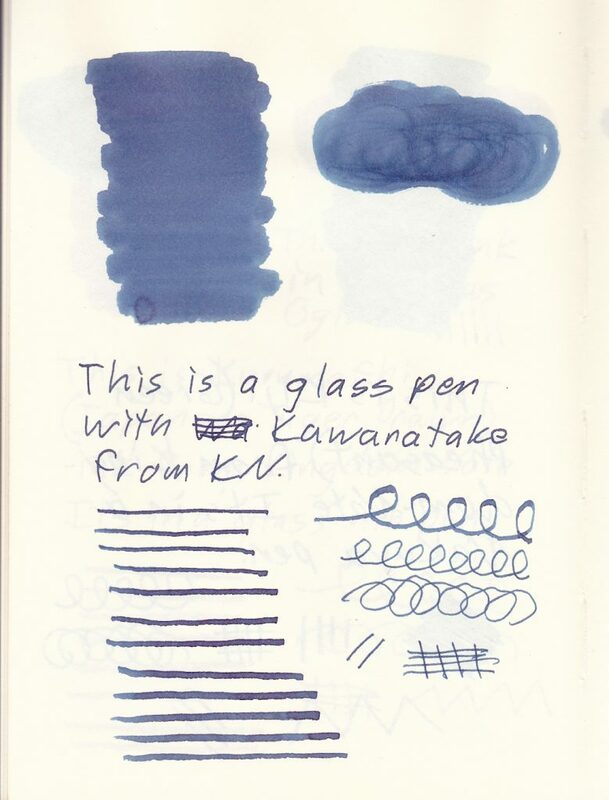 I especially like it in my LAMY 2000. It seems to match perfectly to that pen’s F nib. I don’t own and have not used this series. 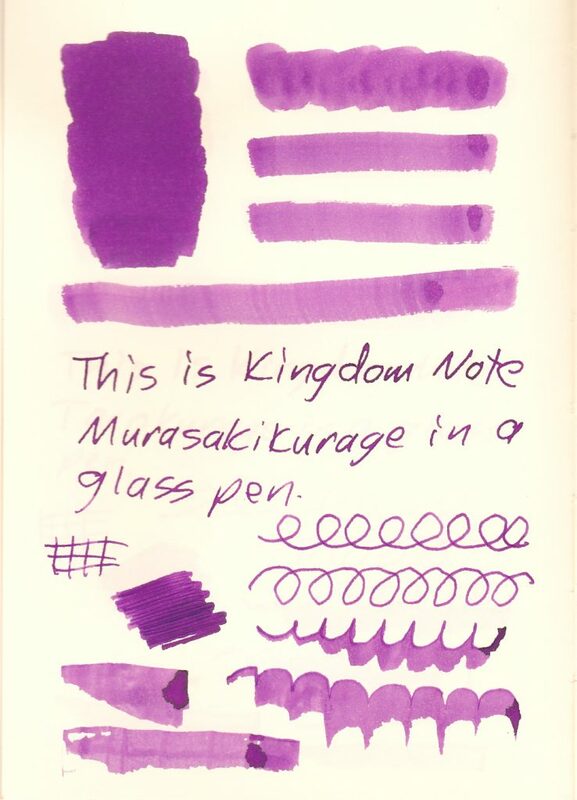 I like the Murasakikurage (aka Purple Jellyfish) and may get a bottle in the future. 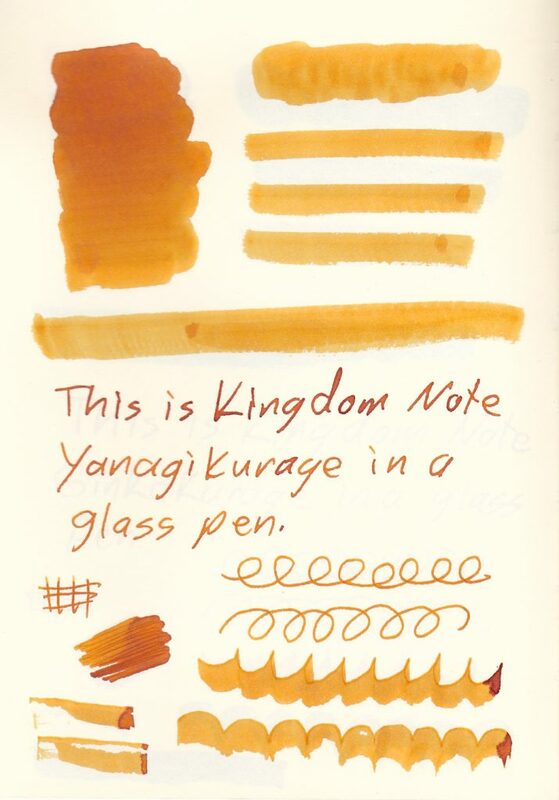 I’m torn on Yanagikurage (Sea Nettle). 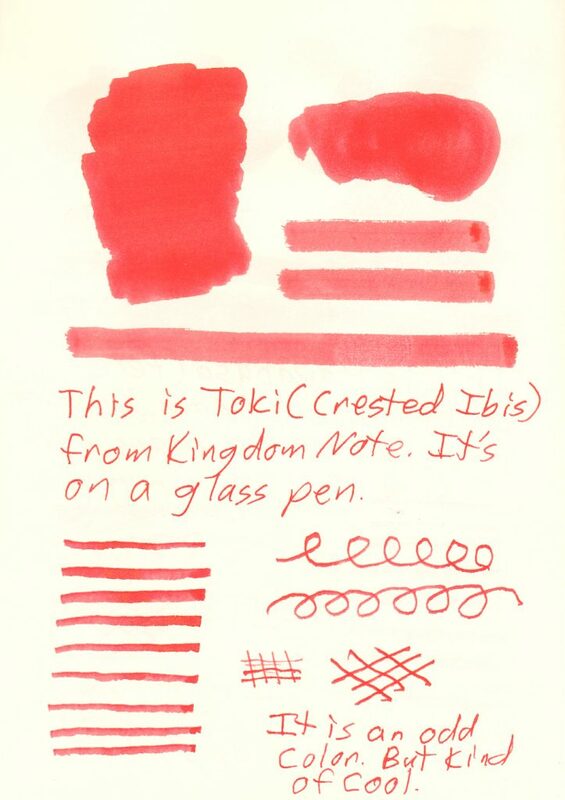 It reminds me of Noodler’s Apache Sunset, but has the advantage of drying in this lifetime. 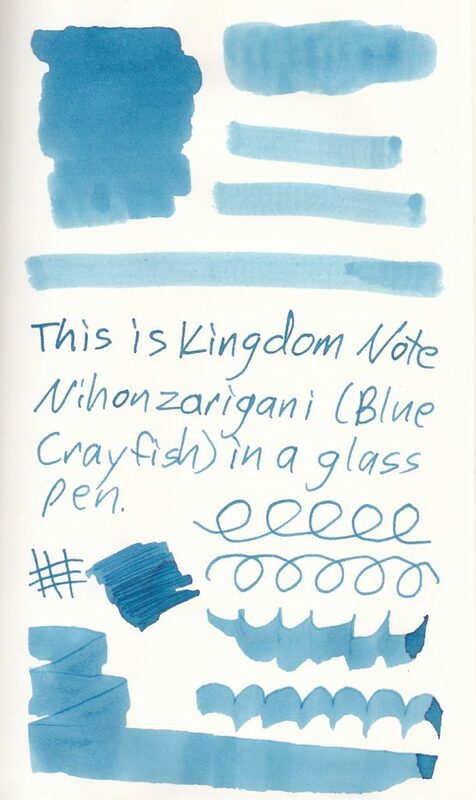 This is part of a new series of inks (with accompanying pens) recently released by Kingdom Note. 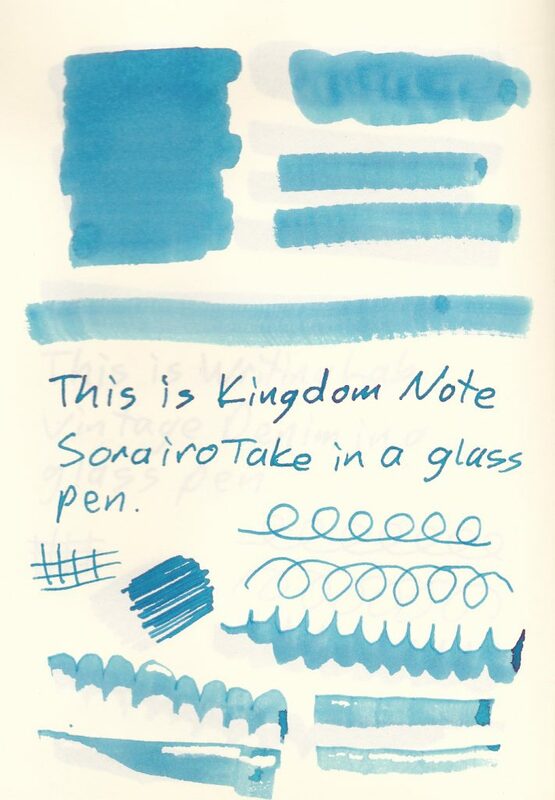 Four inks have been released, but I’ve only been able to get my hands on two. 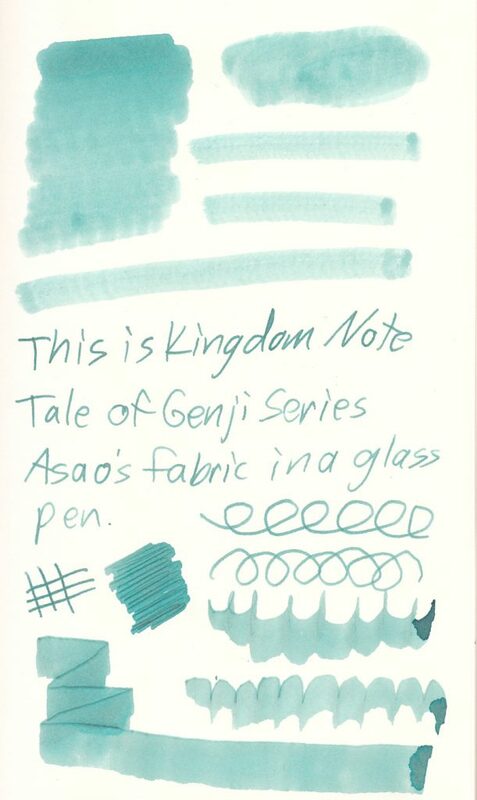 I like Tachibana but am not a fan of Asahanada’s Fabric (misidentified as Asao’s Fabric on the swatch). This entry was posted in Ink, Japan, Kingdom Note and tagged K on June 17, 2017 by DELively.